With additional reporting by Ismail Humaam Hamid and Zaheena Rasheed. The Maldives’ capital city Malé is gearing up for a mass anti-government rally tomorrow. The day will kick off with prayers at dawn and at noon. Protesters have been told to wear comfortable shoes and clothes for the official demonstration, which will start from the Artificial Beach at 3:30pm. Supporters from Maldives’ remote atolls are continuing to arrive by the thousands, and the opposition has set hashtags #EkehFaheh15 (OneFive15) and #AniyaaverikanNinmman (To end tyranny) for the day, and started circulating leaflets on how to reduce the effects of pepper spray and tear gas. Supporters say they are determined to “end the government’s tyranny” and free imprisoned ex president Mohamed Nasheed and former defence minister Mohamed Nazim. 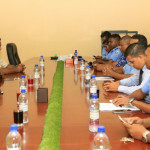 Meanwhile, tourism minister Ahmed Adeeb has accused the opposition of plotting to overthrow President Abdulla Yameen’s government as the police continued riot control exercises on Malé’s streets. “We expect the security forces to confront us, but we have no fear,” a smiling Khadeeja Ibrahim, 49, told Minivan News outside the main opposition Maldivian Democratic Party (MDP) offices at noon today. She was among a group of MDP members who were about to deliver tens of thousands of petitions calling for Nasheed’s freedom to the president’s office. The police turned them back. Nadheem’s face is disfigured by a broken nose after a police officer punched him during a protest in 2012. Nasheed and Nazim’s imprisonment has united former bitter rivals, the Adhaalath Party, the Jumhooree Party and the MDP, who now say President Yameen is out to silence all dissent. The opposition called for the demonstration when Yameen turned down repeated calls for dialogue despite months of nationwide protests. The president made a record number of public appearances this week and has appealed to the armed forces to defend his administration. Among government employees, paranoia and fear is high. 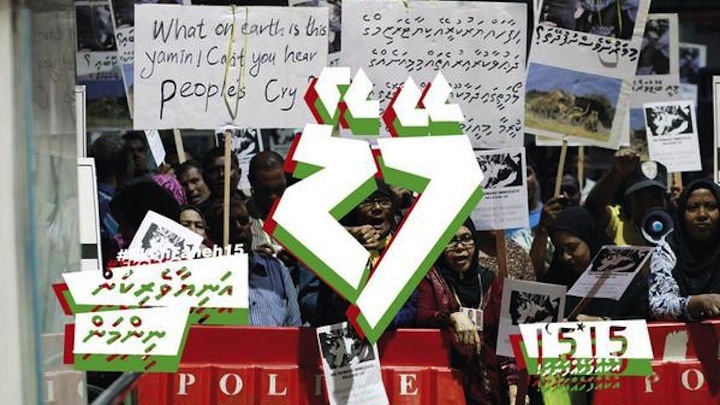 Employees at the state-owned electricity company, STELCO, the Maldives Ports Limited (MPL) and the immigration department say their superiors have threatened them with dismissal if they are seen at the protests. “We are all afraid, I can’t go. I don’t want to lose my job, I have to pay rent and take care of my family,” one 43-year-old man, who works in STELCO, told Minivan News. The MPL has meanwhile arranged a BBQ at 1:30pm and a dinner for all of its employees tomorrow, in a move opposition supporting workers say is aimed at keeping them away from the protest. “We’ve also been told if anyone of us is seen at the protests, we will be dismissed immediately,” an employee who wished to remain anonymous said. The home ministry this week said it has received reports that dozens of island council members are traveling to Malé on state expenses to take part in the protests, and has asked the anti-corruption watchdog to take action. The department of judicial administration has also demanded island offices to provide information on magistrates and judicial sector employees who have traveled to the capital this week. On social media, opposition supporters called for revolution. Elsewhere, supporters shared advice on how to mitigate the effects of pepper spray and tear gas and how to act in the event of a charge by the police. Some proposed home made plastic masks for for pepper spray. The police have also raised concerns over violence, saying they have received reports protesters will harm police officers and attack the residences of cabinet ministers. Tonight, they issued a statement telling protesters to suspend activities for the hour between the dusk and evening prayers and said the demonstration must end by midnight. Adhaalath Party (AP) president Sheikh Imran Abdulla said last night that protesters will perform the evening prayers on the street after a special prayer at sunset, advising protesters to bring prayer mats. The police have released several photos and videos of protest control trainings this week. 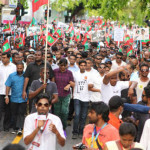 The AP, which has claimed responsibility for organising the protest, must bear legal costs for any unlawful activities that may take place before or after protests, the police said. Some opposition supporters fears of attacks by gangs, who are allegedly controlled by tourism minister Adeeb. Gangsters have attacked protesters in recent months with knives and vandalised their equipment. Individuals who said they will not attend the protests cited concern over a possible confrontation between police and protesters. “I am not happy with the idea of protesting, it creates too much conflict. The end result will not be good,” said 49-year-old Maryam Waheedha. A fisherman who wished to remain anonymous “for the safety of his family” told Minivan News that he was unhappy with the government, but did not like to protest. “I used to make 3,000 rufiyaa a week from two baskets of fish before Yameen came to power. But now I am not able to make that in a month even with a ton of fish,” he claimed. Pro-government supporters denounced the opposition as power-hungry, but said they expect tomorrow’s turnout to be high.